So, I tried my best to make it happen. Walking around Target with my budget money in hand, I was able to get all that I needed, Easter covered as well. Now the balloons. 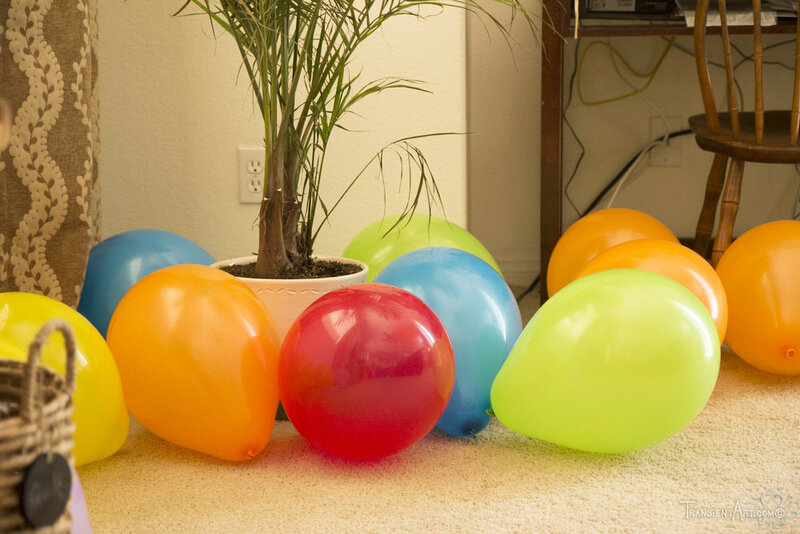 Even though I had a pump and my husband had already made some, I still managed to skin my left index finger raw from tying about 60+ balloons! We used some plain string to tie them together in bunches to hang up on the ceiling and give the appearance of balloons with helium lol. 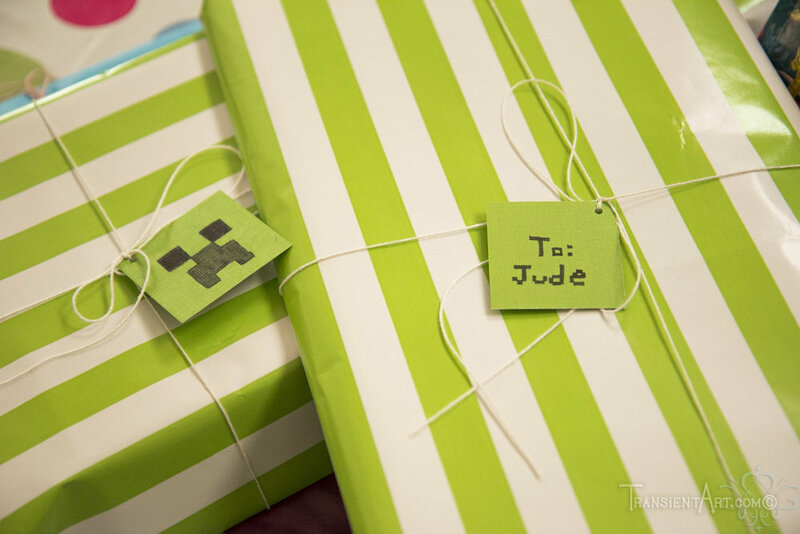 Jacob helped me finish wrapping Jude's presents with string and little creeper tags I quickly made. We made his strawberry cake, and Jonathan and I finished decorating so Jude could see it when he woke up today. 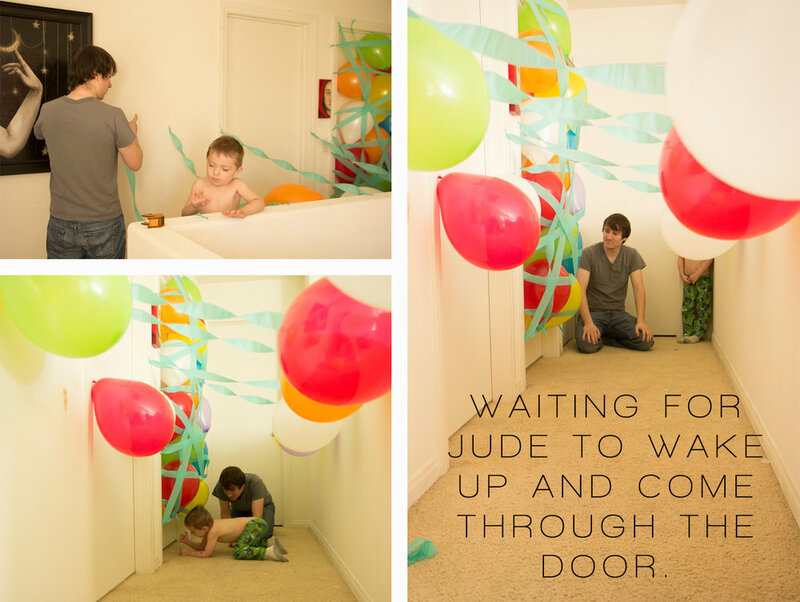 Jonathan and Jacob also put balloons up against the door so when Jude would come out the door he'd be showered with balloons. Jude was a happy camper at the table looking at the decorations and curious about the presents. In the meantime, I made the chocolate covered strawberries (another one of his requests) and ordered pizza for lunch right around the time my in-laws arrived. We had good vanilla ice cream with the cake, it almost had a cobbler taste to me, so I was very pleased with it. I used this recipe, and plan on making it again for sure. One of the gifts I had made for him was the Minecraft creeper drawstring bag to hold his Minecraft toys I got at Target (on sale too woot!). I asked Jacob if Jude would like it and got a very insistent nod back. Minecraft is one of his favorite games that we all like to play, though he usually plays on my character on my husband's server, The Gold Bar. Anyways, I hand-painted the face on the fabric and was very glad when I saw that I had bright green fabric in my stash and didn't have to got to the store for that. I lined it with a black fabric inside and made a matching black drawstring. 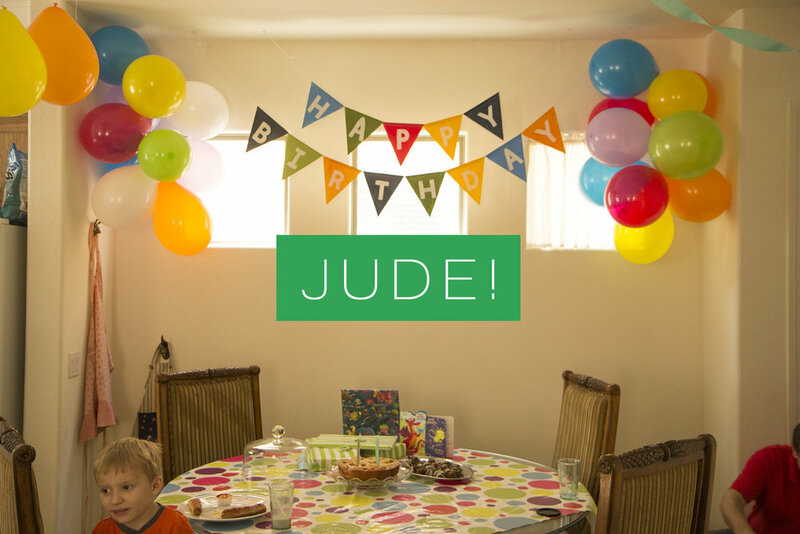 Happy Birthday Jude! We love you!